Sometimes the camera works, and sometime it does not. The result is a set of random photos of Sasha and Dexter. It is a remarkable fact that they can be in the frame moment, I am in a comfortable position, I press the button and nothing happens. I was able to salvage the following photos from this haphazard process. Posted by wmmbb in Iraq Policy, Modern History. Eric Margolis, if I heard him right on AntiWar Radio, said countries such as the the United States and Russia expand until they “hit water”, and then stop. No they don’t. They get a navy. As in the case of the United States they invest in the Panama Canal, set up coal stations such as Guantanamo Bay in Cuba, and display old colonial powers as in the Philippines the projection of naval power, and so cut off the entreport trade between China and South America. Current events and their portents have implications for Aboriginal Australia, but as well in that cruelly ironic phrase “for all of us”. For good and ill, John Howard has seized the moment. If the conclusion is reached, as it might be, that John Howard imperils Australian democracy, and so should be tossed out at the first opportunity, it does not follow that any possible replacement from within his party or from among his opponents will avert the growing danger, since more than likely they will follow in his footsteps and leave similar finger prints by adopting his methods. After all the concentration of executive power in the office of the prime minister has been an inexorable trend for thirty, fifty years and longer. Those who have the mind and the inclination to “seize the prize” may just have the skill to dominate the political landscape and manage the legislative and bureaucratic intrigue before a largely supine and subservient caucus and media, albeit the machinery of the office, not least the spin media managers, will make up for most defects, even if glaringly obvious. Micheal Kirk, producer for PBS Frontline, discusses his new documentary, Endgame, explains that Rumsfeld wanted for the U.S. to leave Iraq almost immediately after the invasion, and some of the various ad hoc “endgames” to get our troops out since 2003. Kirk, a former Nieman Fellow in Journalism at Harvard, was Frontline’s senior producer from 1983 to 1987, and has produced more than 100 national television programs. The program re-evaluates the role of Donald Rumsfeld suggesting that “he wanted out bad from the very beginning”, and traces developments up to his dismissal, the Mid Term Elections, and the adoption of “The Surge”- “the last best hope for the mission in Iraq”. The title “Ampe Akelyernemane Meke Mekarle” is derived from the Arrandic languages of the Central Desert Region of theNorthern Territory. It is pronounced Ump-ah Ah-kil-yurn-a-manMu-kar-Mu-karl. The report has the poetic description provided by a senior lawman of the Yolngu people of Arnheim Land. In our Law children are very sacred because they carry the two spring wells of water from our country within them. We have not got passed the rain yet, and more is expected next week. As I type this the temperature is about 13 degrees Celsius (about 56 degrees Fahrenheit) and my fingers are frozen. Sasha and Dexter would be more camera friendly if the camera worked with greater consistency. This technical problem suggests a replacement is required. Nonetheless there are some photos. Stepping up to the overview. 17 June 2007. Take your usual positions. 17 June 2007. Tongues wagging. 17 June 2007. China is now emitting more CO2 than the United States. 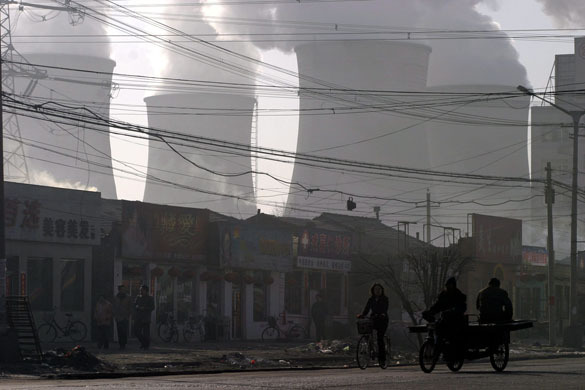 In 2005 China’s emissions were 2% below the US, and in 2006 they were greater by 8%. Kyoto did not hold the Chinese to any targets. They argue that did not cause the problem of global warming, so they should not be held to account for it. Shuozhou, China: Morning commuters pass under the cooling towers of the Shengtou Power Plant , Shanxi Province. The Shengtou plant is one of the country’s largest coal burning power plants. Photograph: Qilai Shen/EPA via The Guardian. Peter Arndren neatly summarises the implications of “above the line” voting for the Senate on ABC Radio National’s Perspective. The governments control of the senate in the last election, the first time since 1980, was he argues the result of the collusion between the two major parties and effectively reduced accountability as it allowed electoral laws to be changed. On this reading, a unhealthy outcome for democratic process, but I would suggest the diagnosis should not stop “at above the line” voting. Loosely quoting Dr Ron Paul, with the name comes the diagnosis, and with the diagnosis the prescription. Dr Paul at least linked diagnosis with prescription in one of his responses at the New Hampshire Republican Debate. (first response) Work stress is not a facile concern with status anxiety as some seem to fatuously suggest but a fundamental imbalance caused by the oppressive, and counter productive nature of much work and its organization with all aspects, not least management. Posted by wmmbb in Humankind/Planet Earth, Middle East. There are those it is said in the American Administration, ensconced in Washington and far from the fighting in Baghdad and other places, who are proposing to extend the murderous rage of this war by bombing Iran, and following the inevitable retaliation, then unleashing the rein of nuclear weapons and bombs, regardless of their economic, political and environmental consequences. It would be better to prosecute such criminals before they act. Posted by wmmbb in Duckspeak. One side’s terrorist, is another’s freedom fighter. One side’s insurgent is another’s resistance fighter. So it has been in one imperialist war after another. Did the Romans call the Jews who opposed them at Masada and the other uprisings terrorists? Possibly. Did the Germans call the Czechs and others who opposed their invasion terrorists? Certainly. And so the British in Kenya called the insurgents there terrorists as well. There are other examples. Thus it may be concluded that terrorist and terror is the language of empire. The BBC reports that there is support for the claim that the Amazon is the world’s longest river. If the new findings are supported the Amazon can claim to be 6,800 km which is longer that the Nile at 6,695 km. The issue revolves around the question as to most distant source for the river, which probably matters for someone other than trivia quiz contestants. The elections took place, and then it took days to count the vote, now it has taken weeks to negotiate a government coalition. The Greens along with the Progressive Democrats have decided to join with Bertie Ahern’s Fianna Fail. Consistent with his promise the leader of the Greens at the election has stood done. The “end of ideology” was pronounced back in 1960 by the US intellectual Daniel Bell. He argued the great ideologies, Marxism, liberalism, and conservatism, had exhausted themselves, and the future lay with pragmatic technocrats. His prediction seemed prescient as Tweedledum and Tweedledee politicians emerged in Australia – all committed to free markets and fair safety nets. But had Bell dropped into Australia in recent weeks he would have discovered that class warfare is raging. The old divisions between capital and labour have re-emerged as stark as in the 1890s. The week began and ended with heavy rain, at least on occasions. And it is cold as well, so we must be in winter. The boys who ride the minibikes tell me it is fun in the rain. I know what they mean. The dogs hold their footing but I find myself sliding along, and keeping balance is the fun part. There was a time when we had to make a run to get home. Sasha normally does not mind the wet, but you might observe there are times when Dexter is not all that impressed. Everything OK for now – then it poured down. 09 June 2007. Something is going on. 09 June 2007. The ABC News Online reports that Howard has been cleared by the Australian Electoral Commission who took advice from the Solicitor General Government Solicitor that use of Kirribilli House for a Liberal Fund raising function was not a “gift in kind”. A gift in kind is a donation of an item of value other than cash. The use of the word “imperialism” seems emotive language, much like the use of the word “leftist”. Imperialism is a historical framework that has left long term imprints on the lives of people in terms of conflicts and their aftermaths, setting up economic impacts, both within the host countries and the home country, the division of territories and linguistic legacies among others. In many ways imperialisms have created the social structures and context for current problems and issues. Western imperialisms, or European Imperialisms have drawn on the Roman model, typically spreading Christianity with capitalism. Posted by wmmbb in Australian Politics, Modern History. Our forebears did not land on these shores just as flotsam and jetsam on the tides of history. Their stories before and after their arrival had a context. The tides and currents of human history always have human motives and human causes. One framework for our self understanding might begin with British Imperialism, and if the current experience in Iraq is any guide, as the Americans carry on the imperial baton, brushing over the tracks of the human record is deeply imbued in the project and its processes. That brushing over the tracks is the reason why we never learned a fuller story of the past at school of the brutality of conquest of the indigenous peoples and the expropriation of their lands, or of the human losses of the First World War. That war lead inexorably to the Second World War, and we hardly know for example at the time the Philippines was an American colony. In many ways since the Second World War, Australia has been transformed, but somehow we remain tuned to the imperialist motif. Chalmers Johnson’s radio interview with libertarian, Scott Horton, is available here.